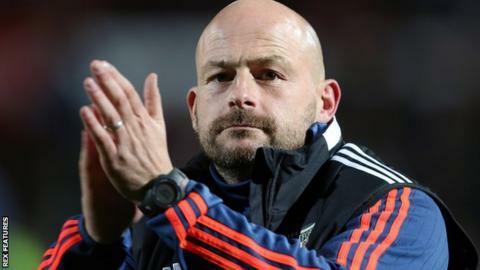 Brentford interim head coach Lee Carsley expects the club to appoint a permanent boss "quite soon". Carsley, 41, was placed in charge until the end of the season when Marinus Dijkhuizen was sacked on 28 September. Carsley has won four of his eight games in charge, leading the Bees up to 11th in the Championship, but he does not want the job full-time. "Myself and the club both know where we stand," the former Derby and Everton midfielder told BBC Radio London. "I had a remit when I took over of trying to get us back on track. We are moving in the right direction. "When a new man is appointed the club will be in a better position than what it was. I would expect something to happen quite soon." Swansea assistant manager Pep Clotet is understood to be on Brentford's shortlist, although the west London club have not made an official approach to the Swans. "Speculation is speculation," added Carsley. "All along I've said the most important thing is the team. What happens with me is secondary. "We're all looking forward to the game [against Nottingham Forest] on Saturday and that's the most important thing. We'll worry about everything else after that." Carsley won the Championship's manager of the month award in October after leading the Bees to four successive victories. Having previously been development squad coach at Griffin Park, he has not ruled out a move into management in the future. "From the first couple of press conferences I did, you could tell I wasn't expecting to be talking about managing a football club," he said. "It's fair to say I'm capable of doing it and feel that in the future it is a route I will go down - but it's not a route I want to go down in the near future. "I still feel I've got a lot of goals to fulfil in the development side of the game."